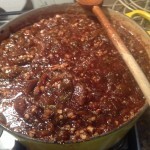 Fig jam….. Ahh. Doesn’t it just sound a little bit sophisticated? My exposure to figs from childhood into young adulthood consisted of a particular cake-like cookie. That’s it. Really. I did not know what a fresh fig looked like. When I moved to California 2007 from many places far colder, one of the first things I did was buy a fig tree and plant it in my front yard. How romantic it seemed to be able to pick fresh figs from my own yard. It’s a small tree and only yields about 3 to 5 figs at a time, but has a long season. 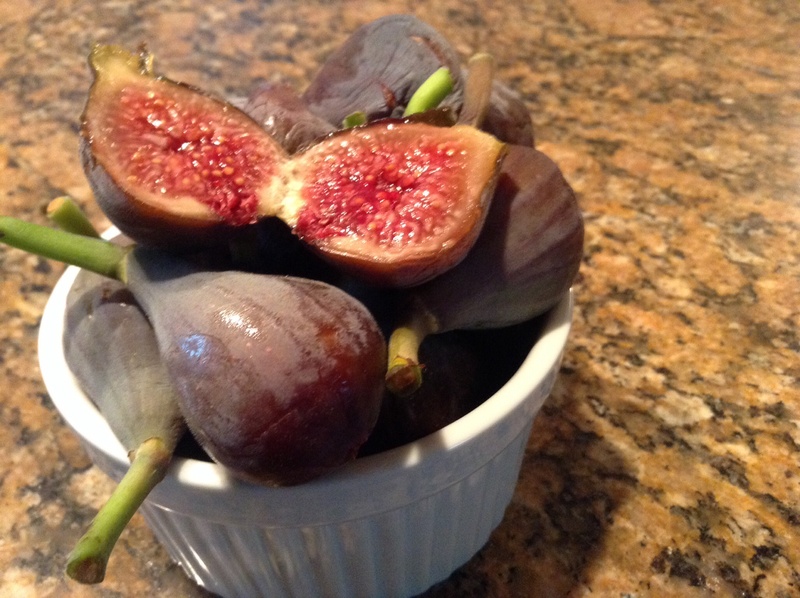 The figs are Black Mission variety and aren’t much to look at on the outside but the insides are pink and complex and gorgeous. They are lovely with prosciutto wrapped around them as an appetizer or fresh in salads. Well it turns out in California I know a lot of people with fig trees too. We have a barter thing going on where I give them fresh eggs from my chickens and zucchini from my vegetable garden I get different things from them… one of them being pounds and pounds of fresh figs. Something I like about this recipe for fig-pecan jam with port is that it is not as sweet as a regular jam and it’s oh-so-delectable on the cheeseboard with dollops of goat cheese and baguette slices, truffle honey and hunks of parmigiano and slices of salami and prosciutto. It’s also a stupendous add-in to a vinaigrette for an arugula and goat cheese salad. 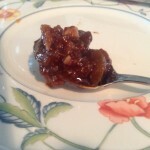 So there’s my take on fig jam with a little sophistication. 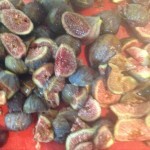 4 pounds of figs, stems removed and coarsely chopped. 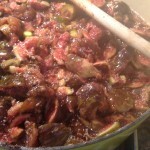 Add figs, honey, sugar, and lemon juice to medium size saucepan. Bring to a boil, lower heat and cook until thick; approximately 60 – 90 minutes, stirring frequently. If at this point it seems to chunky and thick for your taste, use and immersion blender to partially puree, or puree about 2 cups in the blender and add back into the pot. 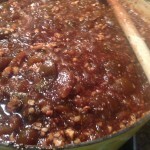 Add the chopped pecans and port and cook an additional 10 to 15 minutes, stirring often. 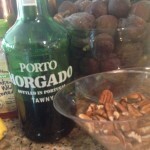 Let cool slightly and taste, to make sure you like the flavor, and adjust sugar, honey, lemon, nuts or port accordingly. Pour hot jam into sterilized ½ pint jars, put on cap, screw band fingertip tight. Process filled jars in boiling water bath for 12 minutes. Let sit un-disturbed overnight, and put the unsealed ones in the refrigerator. This was so so delicious! Served it with crackers and a St. Andre cheese — yum! Can’t wait to try it mixed with a vinigrette over salad. This sounds delicious!!!! I think besides crackers and cheese it would be a nice compliment to Indian curry. Also, one of the best grilled cheese I have ever had was at the Denver airport where they used fancy cheeses and fig jam. It was incredible!! Live your pictures. You make every step if a recipe clear and simple. I can’t wait for your cookbook! !